One of my hobbies is lettering. It is a past time which is definitely worthwhile and of which I enjoy a lot. Writing and creating lettering pieces has been part of my life ever since I was a child and it is part of my personality that I won't be able to eliminate. That is why I am talking about the different reasons of why I am still sticking to this hobby. There are positive reasons and effects of doing this and I definitely believe that anyone doing this agrees with me. Hopefully this will help others to also be interested in this. In art, graphic design and typography, lettering refers to the creation of hand-drawn letters to apply to an object or surface. Lettering covers calligraphy but this lettering gives the artist the option to make different font styles compared to just one with calligraphy in one single piece. However because of modern calligraphy, modern artists are also making changes to the art that it somehow it becomes very confusing with lettering. But since lettering covers calligraphy, modern calligraphy can also be referred as lettering depending on the artist. It is also relatable to drawing as the it is basically the art of drawing letters. This is the spacing between each character or letter. This is very important to ensure the letters and characters are readable to the audience. In Adobe Photoshop or any other editing software, this is the vertical spacing between each line of letters or characters. This also means emphasis on certain elements of the lettering piece. Playing with type hierarchy includes using different font size, weight, color and even style. Some words can be "bolden" to give it more importance, some gets cursive and others get to change the colors of the characters. This is basically made so that the piece becomes attractive. Notice that some lettering piece would tend to squeeze the words to fit into a specific space. In fact it includes stretching the characters too! There are more technical terms in lettering and if it is studied, there are different styles and techniques which supports a type so to make it effective and attractive at the same time. And at the same time, there are different materials that one can use to make their lettering such as regular pen, calligraphy pen, brush pen, paint brush, flat brush, fine liner and echetera. The list can go on and on and it seemed to be endless. In this generation where we are always on the go and the phasing of our lives have been moving fast, we have a great tendency of becoming confused with the fast things that is going on around us. I remember a specific talk made by Peter Tan-Chi Jr., a speaker in the Philippines where in he said that this generation is like a computer game. The game is designed so that it is giving immediate updates to the character, getting the user hooked into the game and would not even recognize that the time has already pass by. After the game, after hours of focusing on the character of the digital game and eyes puffed because of the lack of sleep, our minds get confused. With that, it is good to have time for yourself, stop whatever digital thing you are doing and breath at the same time. With creating hand lettering pieces, it becomes therapeutic because it improves your concentration. Getting your eyes out of the screen and the radiation keeps the eyes and brain healthy too thus resetting whatever is confusing it. Give it a try and surely, you'll feel the great effects of this great hobby. And one more thing, when doing this, it is best to have a good background music playing. It gives more feels to the action plus music is life, nothing beats doing the things you love together with music. Don't also forget the tea or coffee with you! Hand lettering is also another means of enhancing your hand writing. Again, in this generation, most students lets say are not anymore using pen and paper because of the digital age. When I was in college, I only write a few notes on my notebook due to the fact that these information given by the instructors were already available on sheets and digital materials! Most schools now specially in the Philippines are already switching to digital and it has good and bad effects too for the youth. But in terms of writing, it has definitely made a huge negative impact in terms of the hand writing of our youth. Cursive lettering as well at the same time has been degrading big time so it is just time to relearn the art of hand lettering and hand writing. Creativity is by far covers a huge part of our imagination and makes us driven into art. With creativity, you can dive yourself into making new things, original art and it definitely gives you new ideas to future projects. With hand lettering, you can create quote lettering pieces on huge paper sizes, you can use it for your journals too and most specially, you can find beauty in your own hand writing. Appreciating this will bring happiness to your inner self and will open doors to more ideas. Hand lettering, typography in specific has been a trend lately and it is a good thing. With it, most artists are getting hired for creating art pieces that can be used for parties and events. Notice those wedding outer envelopes, inner envelopes, RSVP envelopes, and thank you card envelopes as well as guestbooks, program designs and even the wedding signs and certificates? These days, hand lettering are already embraced for these items. More and more and willing to hire and pay good money to make them for these events and that is not limited to just weddings. Birthday parties are also there, let's say the kids parties where certain artists make these birthday menu type of board design? Or let's just take cafes and coffee shops for this instance too. You'll find hand lettering all around for their menus. Erasable pens or chalks have been used for the design. Imagine if you are the person getting married, celebrating birthday or you have a family member who will be doing so, it would save you a lot of cash to create it yourself instead of hiring someone to do it for you. It will not only be a rewarding thing for the guests to see your own work but it is also saving up your budget. And the best thing about it is that you can also be offering your services to others as well! You are not just enhancing your talent but also earning out of this hobby! It's hitting two birds with one stone! Another good reason to make art out of your hand lettering is it can uplift others too! 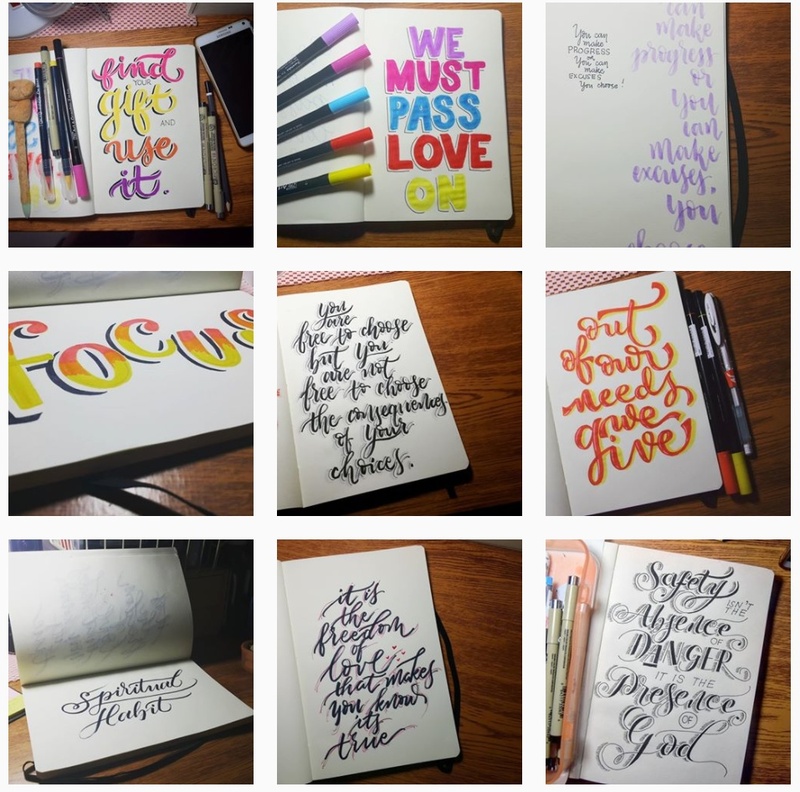 With the use of some social media sites, you can share your lettering pieces through taking photos or scanning them and share it to your audience. Your friends will see it, your family members will do as well and even strangers as long as you set the visibility to public! With that, the people seeing your art are encouraged to also venture in this hobby. There's blessing in those quotes you have written and published and it will definitely give hopes to the rest of the people seeing your art works! So what's holding you now? Give it a try, venture in this new hobby and find yourself happier!